From the end of the Second World War until the fall of communism in 1990, Bulgaria was a communist state ruled by the Bulgarian Communist Party. Then called the People's Republic of Bulgaria, the country allied closely with the Soviet Union and was heavily influenced by Soviet policies and politics. 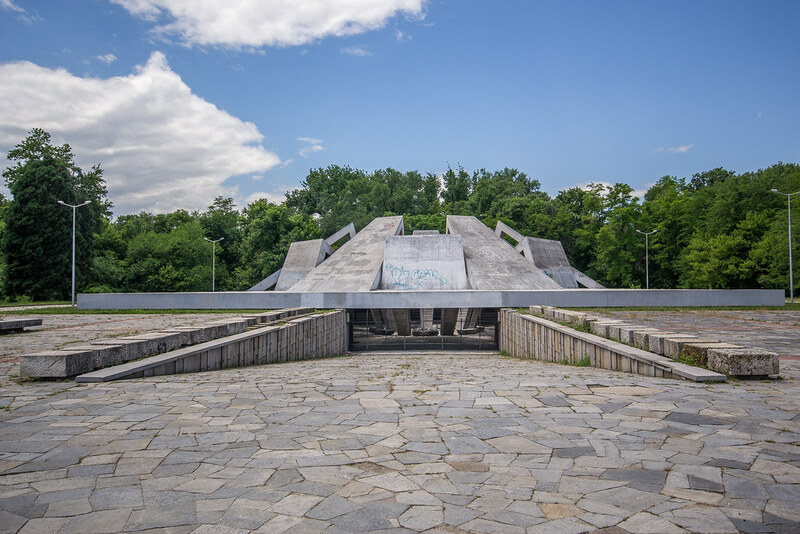 Like the rest of the Eastern Bloc, the leaders of the People's Republic of Bulgaria too were eager to leave the mark of communism by building hundreds of monuments across the country. 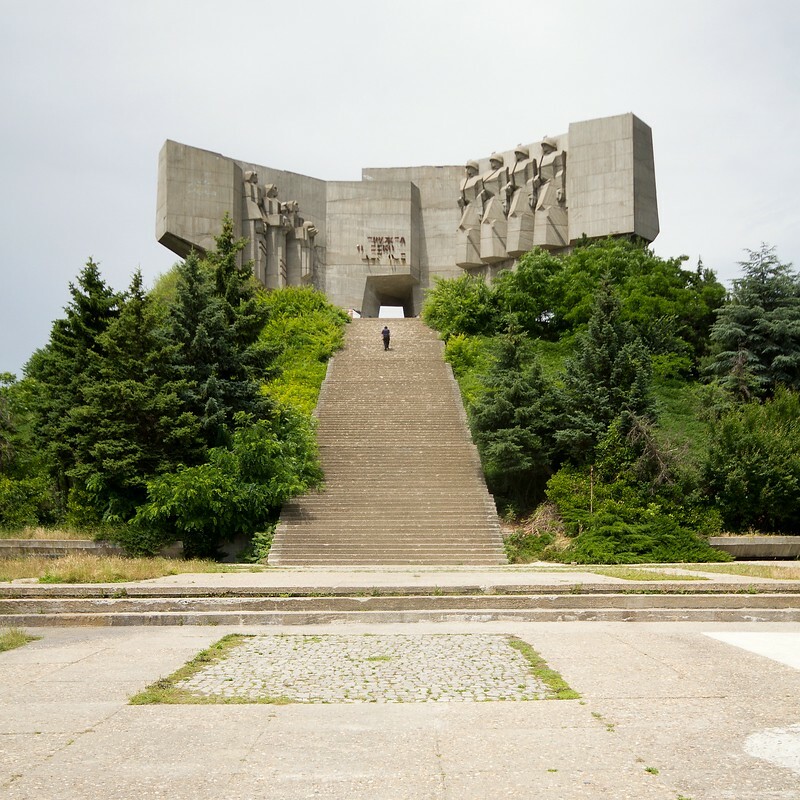 After the end of the Soviet rule, these monuments became reminders to decades of tyrannical rule and of oppression—a period of history modern Bulgarians are keen to forget. Some statues, like those of Lenin and Stalin, were pulled down but others were left standing but neglected, defaced and ransacked. The Monument to the Soviet Army in Sofia, the capital of Bulgaria, is one of the most famous communist-era monument and a popular place for the young crowd to gather. The monument portrays a soldier from the Soviet Army as a freedom fighter, surrounded by a Bulgarian woman, holding her baby, and a man. The monument’s fame lies in the fact that it’s frequently targeted by dissidents who use one of the secondary sculptural composition around the main monument as a canvas for making political statement. The Hillock of Fraternity, also known as Brotherly Mound, was built in 1974 to commemorate the Liberation of Bulgaria from Ottoman rule. The monument resembles a Thracian burial mound, and contains actual bones of partisans who fought to liberate Bulgaria. An eternal flame originally burned inside the center of the monument, though it has long since been extinguished. 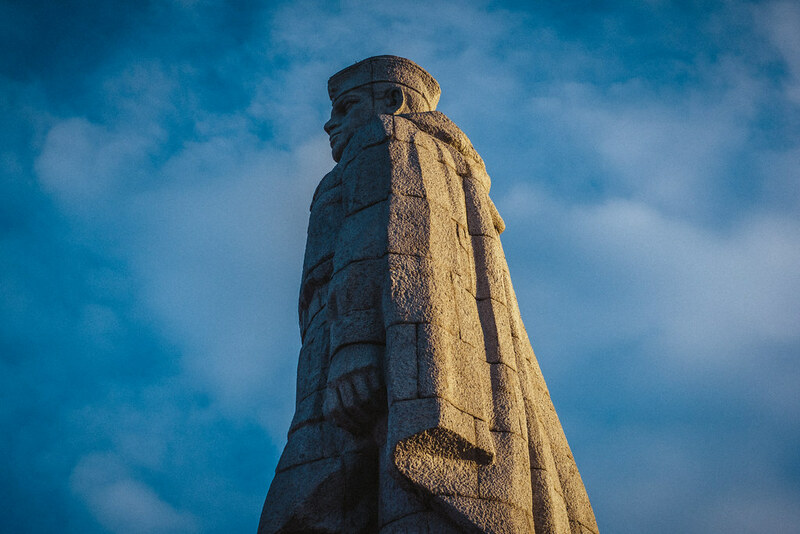 The memorial monument of the three generations in Perushtitsa was erected in 1976 to mark the 100th year anniversary of the city's participation in the April Uprising. It was built on the historical peak "Vlasevitsa" which is also the place of death of the three old negotiators from Perushtitsa who were killed by the Turks during the uprising. The Monument to 1300 Years of Bulgaria, also known as the Founders of the Bulgarian State Monument, was built in 1981 to commemorate the 1300th anniversary of the First Bulgarian Empire. It is one of the few monuments to be in an excellent state. The monument consists of two groups of concrete blocks separated from one another by small spaces. 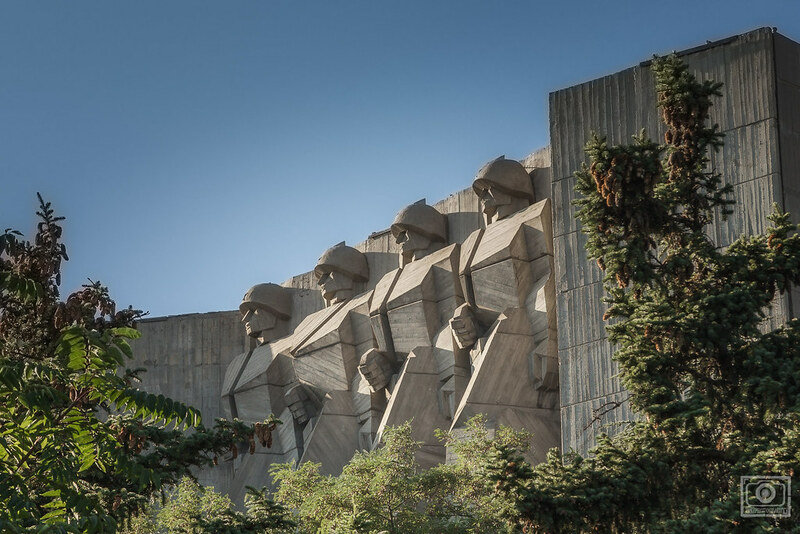 The blocks are adorned with concrete sculptures made in a Cubist style—as seen in many monuments of the communist era— symbolizing the establishment, development and progress of the Bulgarian state in the period 7th – 10th centuries. The memorial to "Stara Zagora Defenders of 1877" is dedicated, as the name implies, to the Bulgarian fighters who defended the city of Stara Zagora during the Russian-Turkish Liberation War in 1877. The memorial was inaugurated exactly 100 years later. 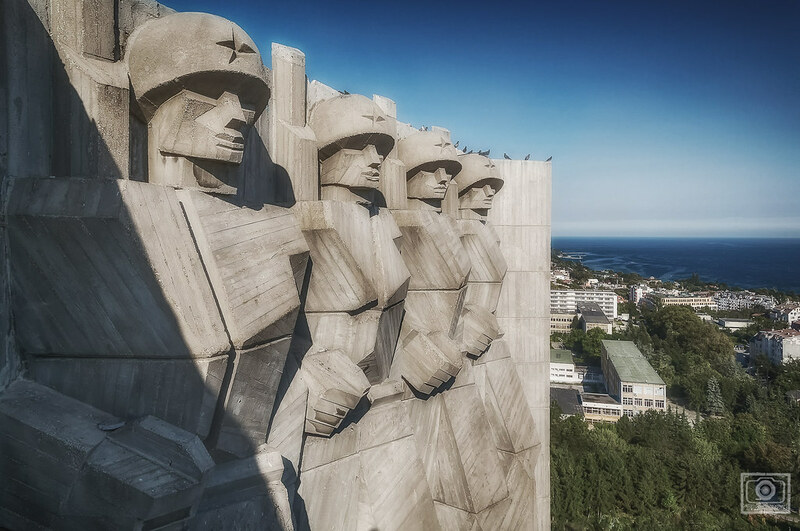 The complex consists of 50-meter high concrete structure resembles a waving banner, an ossuary and statues of six Bulgarian volunteers and a Russian officer. The "eternal fire" in memory of the perished heroes, which resembles the form of a bayonet, burns there. The memorial dedicated to Bulgarian-Soviet Friendship, located on Crane Hill, commemorates Russia’s support of Bulgaria during the 1828-29 Russo-Turkish War. The structure comprises of two wings with colossal figures of soldiers and women on either side. From the base of the hill to its top, runs the so-called “Staircase of Victory” with more than three hundred steps. At the base of the hill, there is a 22-meter-high memorial wall. The inscriptions and bronze-engravings on it tell about the historic ties between Bulgarian and Russian peoples from 1774 to 1994. The Bells monument, situated at the foot of Vitosha Mountain in Sofia, is a unique monument consisting of four vertical pylons, forming a hollow cavity at the top. Inside the cavity hangs seven bells representing the seven world continents. The biggest of the bells weigh an astonishing 3,650 kg. A second ring of bells occupy the base of the monument laid out in a spiral. More than 95 bells from different countries and social organizations are mounted in the semi-spheres of concrete modules that form the ring. The monument was erected in 1979 on of the first Children’s Assembly “Banner of Peace”, held in Sofia in 1979 in dedication to the International Year of the Child. The initiative continued until 1989 under the motto “Unity, Creativity, Beauty”. The Arc of Liberty is located at the highest point of the Beklemeto Pass in the Balkan Mountain. During the Russian-Turkish War, the Russian army took over the pass under extremely harsh weather conditions and with the help of local volunteers. The monument was dedicated to this victory. Buzludzha is a historical peak in the Central Balkan Mountains. It was here, in 1868, the final battle between Bulgarian rebels and forces of the Ottoman Empire took place, and it was here, two decades later, a group of socialists assembled secretly to form a movement that led to the founding of the Bulgarian Social Democratic Party, a forerunner of the Bulgarian Communist Party. 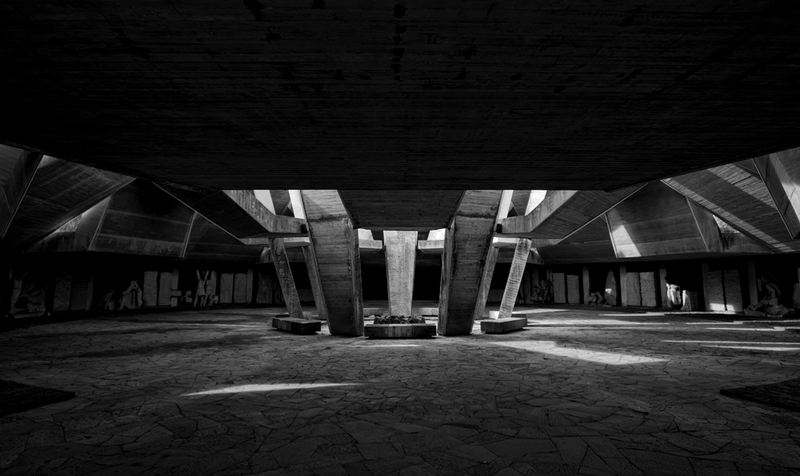 The derelict monument that stands here was built in 1974 to commemorate the founding of the Bulgarian Social Democratic Party. The saucer-shaped monument was once the most celebrated monument dedicated to the sociopolitical movement of communism. But after the fall of communism, like most monuments in the country, the Buzludzha monument was abandoned and left to self-destruction. This 11-meter-tall reinforced concrete statue of a Soviet soldier commemorates casualties incurred by the Soviets during the Soviet occupation of Bulgaria in World War II. The monument is named after Alyosha Skurlatov, a soldier of the 3rd Ukrainian Front who served as the model for this statue. "Alyosha" was also Plovdiv's official anthem until 1989.